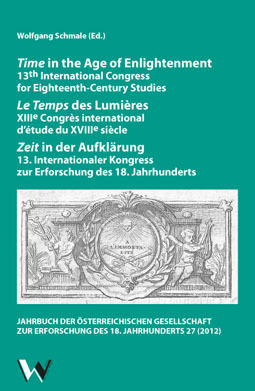 Time in the Age of Enlightenment - 13th International Congress for Eighteenth-Century Studies / Le Temps des Lumières - XIIIe Congrès international d'étude du XVIIIe siècle / Zeit in der Aufklärung - 13. Internationaler Kongress zur Erforschung des 18. J. 2012. 368 S., 15 x 23 cm, 1 graph. Abb., 19 s/w-Fotogr., 6 Tab. Basic principles for the new modern world were laid in the 18th century. Among these were processes like the Enlightenment. Not only did humans think about their life more closely but also they began to shape it more actively. In doing so, the perception of time was a significant factor when ideas about the present and future changed. Due to these changes, the 13th International Congress for research on the 18th century focused on the time aspect. The yearbook presents the three plenary lectures and a general report as a résumé of the congress in its first part. The topics range from important personae over music up to political and cultural aspects. Further essays and literature reports in the second part provide a close overview of the OGE 18 activities. The broad range from political to cultural aspects is covered as well as from Austria to Central Europe. Thus, a cross section of the interdisciplinary and international orientation if the 18th century studies is provided. Reviews and English summaries of all contributions close the volume. Der Band führt im ersten Teil unter dem Schwerpunktthema "Zeit in der Aufklärung" die Plenarvorträge, einen Kongressbericht sowie zusätzliche Beiträge zusammen und macht so die Ergebnisse des Kongresses einem breiteren Publikum zugänglich. Im zweiten Teil gewährt der vorliegende Band mit weiteren Aufsätzen sowie Forschungs- und Literaturberichten einen tieferen Einblick in die wissenschaftliche Arbeit der OGE 18. Thematisch wird dabei eine große Bandbreite abgedeckt, die sich von politischen bis zu kulturgeschichtlichen Aspekten sowie über Österreich und Ostmitteleuropa hinaus erstreckt und so einen Querschnitt der interdisziplinären und internationalen Ausrichtung der 18. Jahrhundert-Forschung liefert. Abgeschlossen wird der Band durch Rezensionen und englischsprachige Zusammenfassungen sämtlicher Beiträge. Pietro Giannone am Kaiserhof in Wien: Seine Erinnerungen in der "Vita"
Literaturbericht: "Geistes- und Kulturgeschichte des 18. Jahrhunderts und der Aufklärung"